This resting day don't get too relaxing, but I've only myself to blame. They've got something called 'Chullpas' here. 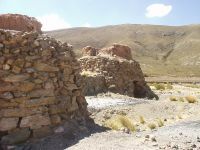 It's some pre-inka buildings which are found many in places including here, I learn from my new info source. She has a small very simple "map" of the area. Besides I borrow a map, which normally costs 5 BOB, and head on out of town. These roads of 6-edged flagstones are terrible to ride for cyclists when they've been used for a long time. 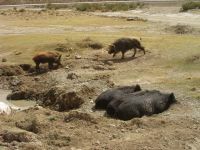 Bolivia is not a country that boasts of its sights, but against all odds I find the Chullpas, see one poor young flamingo and a lot of pigs, road constructions, dumping grounds etc. Just now I'm sitting staring at a jaw of a lamb with tongue, some black potatoes and something which is half a skull of a lamb including contents. I'm out to experince the food culture of the country. Nobody shall say I reject anything. I had to have a beer to have it slip down. I found a black one yesterday, good for anaemics it says, I guess that includes me under these circumstances. It's one of two places I was recommended by the info lady. The most popular. Sure. I avoid the eye. Do the nice lady eat such stuff? I didn't eat too much so I'm happy I bought two cakes for the evening tea. Tomorrow I move towards Patacamaya, there should be a danish project there. I wonder if there are any danes? My room is in the third floor. If I walk in an easy pace, it takes more than a minute before my breath has calmed down. It's no fun. The best night in Bolivia! No, no. Not at all. I've been SLEEPING. I wake up to pee a couple of times but each time I sleep on at once. From 10.30 p.m. to 7 a.m. The road from Oruro is crossing a plain. When I pass the police post outside of town one of the very few signposts tell that it's 227 km to La Paz. But it's a headwind. Not much, but sufficient. It's a boring road and as usual NOTHING to put the bike up against. So breaks are had standing with the bike. After 26 km comes a side road and such places often is a wall, where directions and village are supposed to be seen, but which is mostly covered with political slogans or posters. 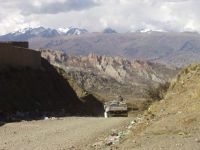 Low mountains all over ahead so something is going to change in this deadly road. After 40 km I reach Humahuara which at first glance seems to be a road town with shops and restaurants, but that's only a branch. The original town is to the right and is quite big. Here the road starts inclining so I'm on the small gearwheel in front. Dandelions are seen at the road side. I've taken a closer look, they look like they've had their heads chopped off several times, a lot of cribbled leaves and a flower that's only 1 inch high. We look at each other. Hmm. Weeds aren't easily done with. The altimeter starts talking: 3830 m. And it keep inclining until I reach a plateau in front of some mountains, where is a big system of low lakes og on the lake some white lines, you never know... yes, my binoculars reveal dozens of flamingoes, it doesn't matter I'm not close to them, it's an experience anyway on this quite monotonous day. And the head wind keeps blowing. The road inclines several times and it looks dark above the mountain. The last two nights it's been rain and thunder in Oruro, even just for short. I turn up the speed to maximum only to see a flat part more and another climb. I should have reached the town Panduro, it must be just at the other side. But faint raindrops falls and for the last piece hails are hitting me. At last I reach to top and see the town lying there a few hundred meters ahead and I already hear loud brass music. There's a fiesta going on. Last day out of three. I talk to someone who claims that all participating are from the village, which I can hardly believe. Do I have to tell you it's cold! Later I arrive at a village with a police post. There's 'alojamiento'. When I enters to enquire and nobody is in the shop and I see an old ladder leading upstairs, I decide to continue. The wheather ahead looks VERY black a little later After the first lightning I consider turning back, but a sign of an upcoming gas station makes me continue. So here I stand sheltered for the upcoming rain and hail. For what? I don't know. It's 5 p.m. and no lodging. It should be only 8 km to the next but in this wheather I'm going nowhere. There's a room with two beds and a TV, where the manager, a young man of 20? lives with his brothers and sisters? I don't know who they are, but there are 5-6 smaller boys and they all live in the room. While I'm there 2 boys the age of 13-14 years arrive on bikes. They left once but came back. 'Mucho frio', it was too cold. They live in the town 8 km ahead and I make one of them write down the name, so I'll know, what to ask for. There should be around thousand inhabitants and lodging and eating possibilities. I think it's near to 6 p.m. when the sun shows under the clouds ahead and I decide that NOW is the time. It's freezing cold, but the wind comes from the side. I had the rain jacket on while I waited, trying to keep me warm. The mountains to the right have turned white. Shortly after one of the boys catch up with me, he that was not wearing shorts. It's gettting dark and I go as fast as I can. From time to time I have breathing difficulties because of the wind - and the other reasons. I turn on the rear light and finally we arrive. He shows me where the lodge is and hurry home to get warm? I have to take off all the bags to have the bike with me through the narrow passage, but now I sit in the sleeping bag writing. It's even more primitive than in Paz�a. The lou is though indoor, but seems to be full. 10 BOB that seems to be the prize for this standard. Went to eat some houses away. There's not much to choose between. Soup with spaghetti things first andd then rize, two big mealy potatoes and some fried meat. 4 BOB that's cheap anyway, but that's like in Huari. This soup is delicious with some spices, I look for thyme in the dictionary, but she doesn't understand. If I'd been caught in the open in this storm it had been bad. I haven't counted for that, so there's no emergency plan. You have to avoid getting wet in such storm and such temperatures. I have only one bread (round, the size of a burger bun) left, so it's a quick breakfast and off I am. The day begins with a climb of 10 km, not so steep, but it feels endless. It's totally bare so it's a strong contrast to reach up to a town with trees, which is situated on top. And for a change I see an unusual church in town. There's got to be a bench there, and that's where I'm going to have breakfast, bread and marmelade I've already bought. There IS a small garden in front of the church with benches, but first the gate has to be opened with a key, says the lady who is sweeping, and a child is sent for the key. And here I am in front of the most wonderful old church enjoying my bread with strawberry jam listening to the sound of the broomstick on the flagstones. It's peaceful, for the first time in Bolivia. Back on the road I'm met by the head wind and have to work almost all the way DOWN to Patacamaya. It's a deadly town. I buy some mint drops and 2 rolls of bisquits. Go on immidiately. It's like my whole body dies. From the trucks I realize I'm still climbing, but it's more the psychic. As soon as I felt real low the wind died for a while and next minute I met a couple from Belgium heading south, they'd started 2 months earlier in Peru. 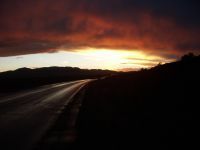 Was going to end i Colhaique in southern part of Chile. Told about 2 hotels 20-30 km's ahead of me, that would be a suitable lodge, and then it would only be 60-70 km in the morning. Encouraging. The road doesn't look so boring anymore, but that can change. And it does! I feel like I'm crawling. My speed is 11 km/h at the most, I think, for some distances 6-7 km/h. But I fight ahead towards the saving hotels - and they show up just as the clouds get darker to the west and the height is 3945 m. Is another storm coming up? I choose the one at my side of the road. Rooms are in the yard, there isn't any 'ba�o privado', but there IS shower. The one functioning with hor water is upstairs where the rooms are 20 BOB, but I'm allowed to use it, says an english speaking lady. I drag the bike into the yard and first I enter the restaurant to have a cup of coffee and 2 fried rolls with honey. All while the storm rise and I'm pleased to be indoors, where one can have a shower, food and a bed to sleep in. I ask about the honey for I think it's the same as I had in Panduro at the fiesta. When I started eating my bread someone came and offered me honey. It tasted fine. Now I learn it's 'miel de ce�a', and the dictionary translate ce�a as a small cup of beer. So it must be some kind of artificial honey produced from beer? A number of perople arrive while I sit there, I guess it's famous for nice food. But beside this encouragement in the late afternoon, I have this comment on Bolivia: Bolivia is a dumping ground and the bolivians are pigs. 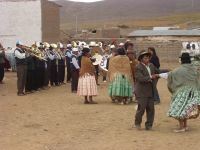 The disposable diper has arrived in Bolivia, it's especially convinient when you go by bus. When it's been used for its purpose, you fold it and throw it out of the window. Followed by glass and plastic bottles. The former are crushed when they hit the shoulder, that's why it is more or less covered with glass fragments. And when a poor brain washed dane stand with an empty plastic bottle and ask the boys in Rio Mulatos, if there's a container for trash, one of them grabs it and throw it down the lane. The dane picks it up of course, and he succeeds getting rid of it in a shop where he's just bought a full one. (The rest of the story is not known). When he later in the same way try to get rid of one in Ayo Ayo, the girl says: "Throw it in the river!" And yes, that's what they do in Ayo Ayo. I've never seen such a small river with such an enourmous amount of trash. I took it with me fastened so loosely that I'd probably loose it on the way, but no - it followed me all the way to the hotel, where I had a boy take care of it. The only thing you miss in this hotel, like in all others, is HEATING. When it's frosty outdoors, it'll get a bit cold indoors, especially when the door like mine fits in one side but is missing 5 cm in the other. There's only one solution: the sleeping bag. I have the best breakfast for nearly 2 months: Coffee, toast, marmelade, that has to be homemade, juice, that means real freshly pressed juice, and something creamy from which I'd thrown up when I was a kid. It's covered with a "skin" but tastes delicious. Maybe my body is aware that these calories are important. When I have to pay, I have to tell her, she's forgotten the breakfast. I before leaving I have to have a glass of honey, that will do my throat good, and when they ask, where I'm going after La Paz and I speak about Macchu Pichu, the nefew has been there and have some pictures he wants to show me. So it's 9.30 a.m. before I leave. It looks like the road is inclining but the speed tells another story. But that changes fast. It's blowing less than yesterday but still I'm moving slow I feel. Imagine going up hill with only one lung and the longer you come the steeper it gets and the more the wind blows and just when you're almost there you're passed by a bus or a truck with an exhaustion that threatens to choke you. I should do the first 25 km before 12 o'clock. 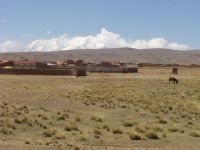 The altimeter refuse to cross to 4000 m, but stop at 3995 m. After a hillside that shows to be the "last", snowcapped summits are seen in the distance, and in front of them something is flashing. 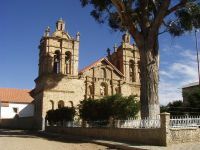 Can it really be La Paz? It's almost 50 km! It can. It's far and on this plain I come to the wind blow like yesterday, but the road declines? To the right a snowcapped giant rise, there's no black colors, it looks like a huge lump of snow. The plain that seemed flat is actually going up and down, up and down. So, first crawl up, then work to get down. Not very encouraging. The only comfort is, that for every thread I'm closer to my goal. But I feel exhausted both physically and psychically. In the end I'm crossing another hill and the rest of the road is flat in front of me. Shortly after the dumping grounds start on both sides, unfortunately there are not enough buildings to shelter for the wind, that now comes from the side. That's an advantage, but also the problem, that I'm from time to time almost blown off the road and every passing of a truck takes me to the middle of the road. The result is that I find different alternative tracks outside the road for some distances. The desolated "entrance" to La Paz continues: garbage, barely finished buildings, half destructed buildings, stocks, small industry. Mile after mile. Or according to a signpost: To El Alto. 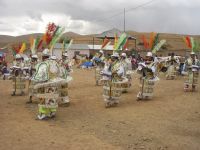 Is El Alto before La Paz? It doesn't fit with my expectations. 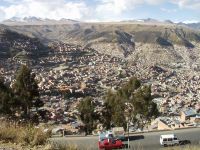 You have to know that El Alto, 'the high', is lying higher than La Paz, it's where the airport is. But the road to the city continues. At a moment, where I feel for urinating, while it not possible, I pass a side road, which apparently goes down a red valley, where houses can be seen on the opposite mountain side. It's fine for my purpose, but also gives me a hint, that it might end with me going DOWN to La Paz. After one endless mile after another, where more and more houses appear, I see some planes to the left, so this has got to be El Alto. It's almost 4 p.m. and all busses, minibusses, taxis and whatever they're called apparently start from here. It's a marketplace of yelling, whistling police officers and cars. All try to get as many customers as possible, before they're forced to leave. How I, in my weak condition, get through this mess, I don't know, but through I get, and then it's revealed, when we get to a toll road: I was right. 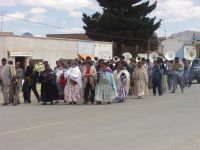 You have to cross El Alto to get down to La Paz. The altimeter reached the 4000 m in the end, the road was inclining a lot the last parrt: 4065 m, and down there as a fata morgana, is the city in the forgotten valley: La Paz. It's marvellous. My fatigue, my suffering is all gone in a moment. There is now the advantage that I don't have to thread anymore. The road has a shoulder, which is rather bumpy, but just to roll along feels like a reward. Where I'd decided to write, that the arrival to La Paz wasn't a triumph, but just an old mans stubborn denial of his strength being exhausted, then it is in a way. There's no more wearing and tearing, only concentration on the road ahead and using the brakes. 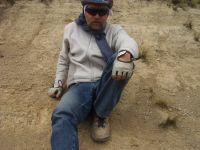 When I had lunch I chose a hotel from Lonely Planet, I thought, it was fine in Oruro. A rather central one. When I now come rushing the rroad divides and I need L.P. with the maps. And 'Avenida Montes' is just the one for me. I just have to stop at the right spot, then my street will be to the left, and at some moment I decide to stop and ask, and I do, and 'Ingavi' is just accross the street. Five minutes later I'm at the hostel and ten minutes later I have a room with 'ba�o privado' for 40 BOB and my bike has put put into a depot and I just have to wait a while for the room to be ready. This swift change from total exhaustion to total relaxation with a cup of tea and a roll of bisquits was exactly what I needed not to loose my fait in Bolivia totally. leading down to a small square. It's an incredible sight: the lights on the mountain in the background, below the stairs are all kinds of booths and light and everywhere people swarm. I don't have to worry about the restaurant, there are plenty. I choose one that shows to be expensive, 30 d.kr. for a dish. What the hell! Am I a millionaire or nor? They're playing "Where shall we sleep tonight?" (danish popular song), that is in spanish, but isn't it originally a danish tune? According to L.P. you have to be careful with alcohol in the heights. As they write: after the third beer you're pretty drunk and after the fourth almost unconscious. It's not totally wrong. Half a liter of draught beer has had it's effect, but the millionaire has to have a piece of pie and a cappucino, before he try to find his way home. Good food here. A hell of a piece of cake and an artistic cappucino with cinnamon and icecream I think. NOW the need of calories is covered, but a long distance cyclist ought to eat like this EVERY day.